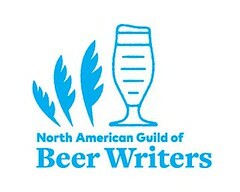 * According to The Drink Nation, the craft brewing industry, on average, employs fifty-nine employees per one barrel of beer produced versus AB InBev at one employee per barrel. The slug for this post paraphrases "Silent Cal" Calvin Coolidge, 30th President of the United States, who said, of the Great Depression: "When more and more people are thrown out of work, unemployment results." 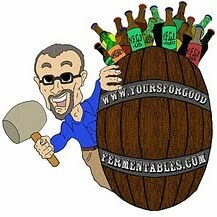 The historical brewery numbers are from the [U.S.] Brewers Association: here and here. 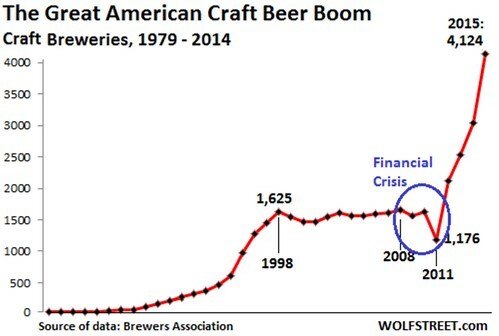 The graphic above, posted to Business Insider, has slightly different data points than the Brewers Association, even though Business Insider cites the BA as its source. 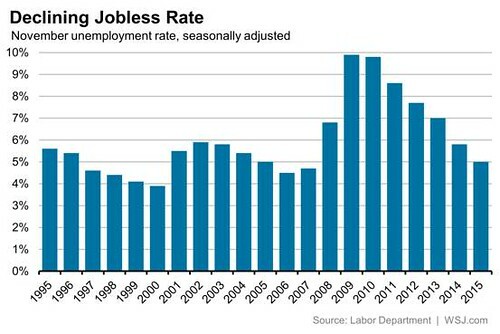 The jobs data from December showed a labor market that is steadily growing but providing only modest wage gains to employees. Last month the average hourly wage fell by a penny, to $25.24. Since one year ago, wages are up 2.5 percent — below the pace from before the Great Recession, but a tick above the crawling pace maintained throughout much of the recovery. [...] Some economists say that a massive shadow workforce still lingers on the sideline, a group that is not currently looking for jobs and not counted in unemployment figures. The share of Americans holding jobs or looking for work has fallen steadily for 15 years, and in December, the so-called labor force participation rate was little changed, at 62.6 percent.